In red, must be Carnegie. I’ll be bound. At golf, or anything a sort of poet. 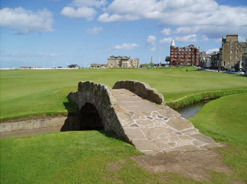 In 1842, a third edition of Golfiana was published that included another poem about St. Andrews called “Another Peep at the Links.” The last stanza of this poem might be described as Carnegie’s final tribute to the course he loved. Grey is my jacket, growing grey my hair! Mine is, at best, a despicable game. Club, players, caddies, balls, everything. Shall peerless reign, and challenge all the world! Though written long ago, this is the St. Andrew Links that will yet again soon host another Open Championship. In two Posts earlier this year, “A Poetic Response to the Rise of Medal Play in 1912” and “More Match Play Poetry,” I wrote about the controversy regarding the switch to medal play that occurred around the turn of the 20th century. In the beginning players who competed on the basis of score were scorned. Apparently, the poetic upset with the “score-keeping man” goes back even earlier. Here are eight lines of derision written by Patrick O. Macdonald (he certainly had the right name). The verses appeared in the magazine Golf in 1898. And not the whole creation. You may be aware that Jim Hyler, the new USGA president, is promoting more environmentally sustainable golf course maintenance practices. Maybe he should advocate a return to match play as well. Think of all the trees that would be saved from becoming score cards! Joe DiMaggio had a brother named Dom. Harry Vardon had a brother named Tom. There was a third DiMaggio, another brother named Vince. And there was a third Vardon, but not another brother. 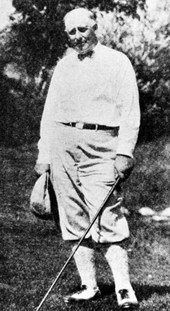 This Vardon was featured in a paragraph on p. 116 of the August 1910 issue of the magazine Golf. In the annual match between Brantford Golf and Country Club (Ontario) and the Galt and Waterloo Golf and Country club, July 1st, Dr. Vardon, who was playing last on the Galt team, drove the last hole, the ninth, and holed out in one. Dr. Vardon, a very popular physician in active practice, is over seventy, and weighs ninety -eight pounds—proving brains can always hold its own against mere brawn. Two Vardons on this earth do dwell. 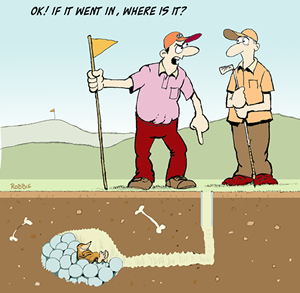 To see another Vardon rise. A hero, in true modesty. He weighs, in fact, but ninety-eight. Will stand the test of endless time. The man who’s drive “holed out” at “nine”! Unfortunately, Dr. Vardon’s surname appears lost to history. Baseball footnote: Vince DiMaggio was the oldest of the three brothers. During his baseball career he played for several National League teams, starting with the Boston Bees in 1937. I will always remember Vince for the “tape measure” home run he hit to the right of the clock atop the left field wall as a member of Oakland Oaks in 1948. The home run capped a ninth inning rally of seven runs giving the Oaks an 8 to 6 victory over a rival Pacific Coast League team whose name is also lost to history. I should also mention that the Oaks that year under Casey Stengel won their first pennant since 1927.